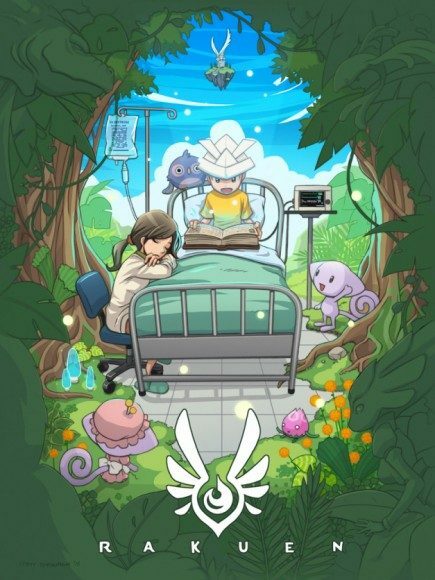 From fights between Plants vs. Zombies to now an upcoming story-based adventure game that takes place in a hospital, Rakuen, the composer Laura Shigihara, has released the first official trailer for the game, which is set to launch at the end of 2014. The game will first be coming to PC, but there are hopes for possible ports to other platforms. In Rakuen, players experience a game that doesn’t involve fighting, but instead involves an adventure where the hero/the helper is a little Boy that has been sent to the hospital, and that is now his life, his home. With this new life, the little boy asks his mother to read his favorite story, where it takes him into the fantasy world known as “Morizora’s Forest”. With this story that takes him to the fantasy world, it helps this little boy not only come to terms with the his problems, but it also allows for him to go to fellow patients in the hospital and help them. In the storybook itself, the child is all alone when everyone from the tribe leaves for safety to a paradise isle known as “Rakuen.” The little child themselves, goes through the challenges in order to finally reach the Guardian of the Forest “Morizora.” Once they reach there, the little child gets one request or one wish for the courage that it took to get there. That one request was to take a magic ship ride to them to the tribe that fled for safety in Rakuen and now the little child is surrounded by those who love them. This journey that this little child took, inspired the little Boy in the hospital to take the journey of his own filled with challenges, in order to ask that one request of the Guardian of the Forest. Be prepared to take on the puzzles and mysteries that will challenge you in the hospital in order to help out the little boy in the hospital come to terms with his new life. You can find out more information about Rakuen on the official site. Plus get up-to-date info on Rakuen via liking Laura Shigihara on Facebook and following her on Twitter.